We’ve combined a classic hot chocolate taste with a hint of coffee to create your dream Mocha. The balance between lovely chocolate and coffee makes this the drink of choice for coffee and hot chocolate enthusiasts alike. As for us, we just can’t decide which we like more! 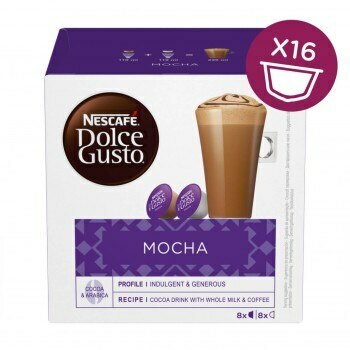 Mocha is a true coffee shop favourite, and our stylish NESCAFÉ® Dolce Gusto® machines are just right to turn that Mocha pod into a professional, barista-style experience at home. Whether you’re chatting with friends or unwinding after work, a cup of this delightful chocolate-coffee combo is sure to soothe those cravings for something hot and satisfying without you having to leave your kitchen. With a light layer of dreamy foam and its deeply intense colour, it even looks the part. A great addition to any NESCAFÉ® Dolce Gusto® pod collection, have some of these on hand for unexpected guests or when a normal hot chocolate or coffee isn’t quite what you’re after. If you like the rich taste of our Mocha pod beverages, but sometimes fancy something less sweet, you might also enjoy exploring our extensive Cappuccino and Latte selection. Whole Milk Powder, Sugar (10.1%), Emulsifier (Soya Lecithin). Whole Milk Powder (32.0%), Sugar (31.6%), Cocoa (23.8%), Soluble Coffee (12.5%), Emulsifier (Soya Lecithin). Nothing like a coffee shop Mocha, like a weak hot chocolate. Don't think I would buy again. Hot chocolate and a shot of coffee. A two pod drink, one for the milk and one for the chocolate and coffee. I didn't find the coffee to be strong, didn't think you could really taste it until I made one for my friend and she couldn't drink it due to how strong the coffee was, so I was happy with my two cups, I did make my friend the hot chocolate. My special 'once a day' treat. I don't necessarily follow the recommended amounts given on dolce gusto pods. I make this, the hot chocolate, and the latte with a setting of 3 for the milk pod, and 6 for the other ingredient. Just perfect for myself and my size mugs. i am usually a big fan of a mocha and would usually order it at any coffee shop so was very disappointed when I made this and it doesn't even taste like a mocha I cant taste any coffee even if I don't even add the milk it just taste like a weak version of the hot chocolate will not be buying again!